Law Web: Whether court can take recourse to plea bargaining in Cheque dishonour case? Whether court can take recourse to plea bargaining in Cheque dishonour case? imprisonment for six months also." complaints for offence punishable under Sec.138 of the N.I.Act. and personal liberty of an accused. Dated this the 6th day of July, 2017.
months to the accused for paying the fine/compensation amount. to undergo simple imprisonment for 6 months, etc. bargaining has been complied with, except for the minimal formalities. court accepting the plea bargaining, etc. the said interim order has been extended from time to time. the Cr.P.C and that the Original Petition is liable to be dismissed, etc. the instant case is bereft of any merit. findings made by the learned Single Judge in the judgment in Joseph P.J. reliance on the judgment of the Apex Court in Girraj Prasad Meena v.
as 12.11.2011. Ext.P-2(3) affidavit does not even contain any date. this appears to be filed purportedly under Sec.265C of the Cr.P.C. of the trial court but strangely the date portion is completely left blank. complainant was duly conducted in terms of Sec.265B(4) of the Cr.P.C. of Kerala & anr. reported in 2015 (5) KHC 586 and Bala Dandapani v.
into police diary as an accused person but it also includes a suspect. cases would fall under Article 20(3) of the Constitution of India. 13. The historical origins of the "right against self-incrimination"
clothed in this country with the impregnability of a constitutional enactment.' ........"
to extract information through such compulsion as a matter of course. follows in 378 US 52 (1963) p.55 = 12 L.Ed 2d 678 pp. 681-682. `a protection to the innocent'." thereafter consents to be questioned." case (supra). [see report in 384 US 436 (1965) pp. 457-58]. product of his free choice." warning given by the interrogators is not alone sufficient to accomplish that end. any questioning if the defendant so desires." should be examined and analysed. The judgment of the U.S Federal Supreme Court in William J.
entered of the factors relevant to this voluntariness determination. the defendant's understanding of the nature of the charge against him. whether they understand the action they are taking, etc. has been obtained in violation of the due process and is therefore void. a full understanding of what the plea connotes and of its consequences . concerning his plea and the petitioner did not address the court. of these three important federal rights from a silent record. Court has clearly held in para 20 of the ruling in Girraj Prasad Meena v.
any grievance before the appropriate forum." court and had remanded the matter to the trial court for disposal afresh. 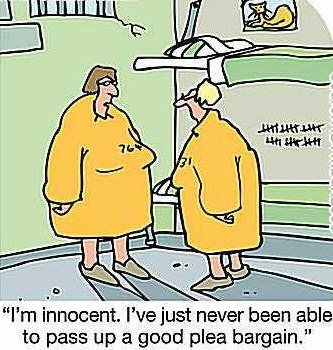 would vitiate the acceptance of plea bargaining by the trial court, etc. complainant on this aspect is untenable and is thus overruled. conviction on the basis of such plea, it would vitiate the conviction. tried. It is also to be ensured that the accused are duly represented through Advocate. 2. AIR 1966 SC 22, Mahant Kaushalyadas v. State of Madras. 3. 1973 CriLJ 358, S. Chinnaswamy v. The State. 4. 1999 CriLJ 2857, Anand Vithoba Lohakare and Others v. State of Maharashtra. was set aside and the matter was remitted to the trial court. plea bargaining, which came into force only with effect from 5.7.2006.
enhancing the sentence in appeal or revision. this Court, Subramanian Potti (J) as his Lordship then was, in State v.
not automatic and does not follow merely because such plea is made. accused may not be properly advised because of the situation in which he is placed. acting upon such plea and convicting the accused without may evidence. by the prosecution which, even if true, may not be sufficient to constitute an offence. himself to be a merchant dealing in broken glass pieces and obtained an advance of Rs. unsustainable. Plea of guilty did not preclude a challenge to the inference drawn." construed to constrain the meaning of any provision in Chapter XXIA. Prosecutor appointed under section 25." the opinion of that Court, a failure of justice has in fact been occasioned thereby. provisions in Chapter XXIA of the Cr.P.C are indeed mandatory. been referred to in detail in the preceding paragraphs of this judgment. to show that the accused has made such an undertaking in that regard. notice of the civil court by producing a copy of this judgment. this judgment to the trial court. (Criminal) stands finally disposed of.